Along with the Strat and Les Paul, the much loved ‘Tele’ has helped to forge modern guitar-based music. Leo Fender released the world’s first Telecaster in 1951, probably with little idea that his design was going to be so popular. He initially named the prototype guitar a Fender ‘Broadcaster’ but had to rename the instrument due to copyright reasons regarding Gretsch’s Broadkaster drum kits. The final Telecaster design has stood the test of time and remains one of the most popular models on the market – and in the never-ending Telecaster vs Stratocaster debate – holds it’s own pretty well. In this article, we tell you everything you need to know before buying one of these iconic electric guitars. The Telecaster’s success is most likely due to its fast manufacturing time, convenient playability and versatile edge, which enables it to be used in a wide variety of music. In terms of design, Telecasters are simple, with a single cutaway body and a pair of single coil pickups in the bridge and neck position, for that famous bright twang. Tele’s are often heard in classic rock bands and are superb electric guitars for blues. For example, artists like Syd Barrett, Jeff Beck and Mike Campbell have all used Telecasters in their music. It’s worth mentioning that you can get alternate models that have Humbucker pickups built in, for extra warmth and sustain. As you’d expect from a six-string guitar, the Telecaster headstock features six, single side tuners. Some older, vintage models even had barrel bridge saddles for easy tension adjustment. The original Telecaster was also one of the first guitars to have a body made from a piece of solid wood (usually ash or alder), and to have wiring cavities cut out by machinery, for easy access. Before this, almost every guitar was hand carved, which sounds lovely, but in reality, was expensive and time-consuming for manufacturers. Fender never bothered with the traditional set neck, instead, he used a bolt-on version, which helped ensure that production was quick and efficient. This also meant that if the neck became damaged, it could be easily replaced – which is a big issue in single piece guitars. 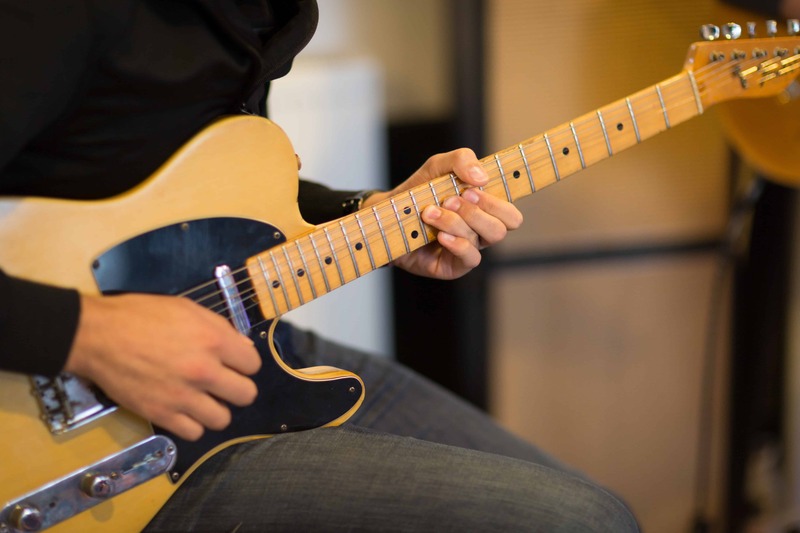 Interestingly, the original Telecaster neck was usually made from a single piece of maple, or occasionally mahogany, without any additional fingerboard wood. As you can imagine this greatly reduced the manufacturing time too. Some musicians were against the idea, however, and decided to glue on mahogany fingerboards regardless. But either way, these design concepts meant that Tele’s could be made efficiently, whilst remaining easy to play and produce a great sound. It’s worth noting the full-sized scale length too, which, like it’s sibling the Stratocaster, gives you ample neck length to work with; as opposed to say the Les Paul which has a much shorter scale length. Nowadays, there are plenty of alternative Tele designs out there. Some vintage models have a nitrocellulose lacquer, for that retro look, whereas modern Telecasters have a thicker, more protective polyurethane or polyester finish. Different models also come with various fretboard radiuses. For example, vintage Teles have a 7 ½ inch fretboard radius and modern versions usually have a 9 ½ inch radius. People with smaller builds will most likely find a smaller radius more comfortable to play with, on the other hand, large folks would be better off with a larger version. Telecasters come in a variety of body woods depending on the particular model and manufacturer. More expensive versions are most likely going to have a body made from ash or alder, for bright, long sustaining notes. Pricier teles may also come with a maple, ebony or rosewood fretboard. Maple is great if you want a really bright tone, whereas rosewood will give you extra warmth and resonance and ebony is ultra-smooth, for seamless chord changes and arpeggios. On the other hand, cheaper tele copies usually have pine or basswood bodies, which are easier to manipulate during the manufacturing process but don’t produce lows or highs quite as well. Squier is well-known for producing well-made, affordable Telecasters, but the company itself is still a division of Fender. Squier Teles are based on the more expensive Fender models, and share many of the same design features, like pickups, tonewoods and bridges, just at a lower price. With that in mind, it’s not all about Fender. ESP, Harley Benton and Chapman Guitars also produce some really well-made copies too. Telecasters are primarily made in either the US, Mexico or Asia. With that in mind, most dedicated Tele fanatics praise US and Mexican models the most, due to the high-quality materials and craftmanship involved in their making. But, saying that, some great guitars still come off the production line in Asia. Asian versions are often slightly cheaper too, so would perhaps suit a beginner guitarist, looking to get a feel for Telecaster scene before spending more on a more expensive, specific model. Squier’s Classic 50’s Telecaster is the most affordable model we talk about today, and for the price, you get some fantastic features considering this thing is mass produced in China. The best thing about Squier’s design here has to be the pair of custom made, Vintage Alnico 5 pickups. These single coil pups should ensure that your tone is sparkling bright for badass solos, but also warm and rich enough to play blues, classic rock and jazz styles. With that in mind, these pickups aren’t made to sound that great with loads of distortion, if anything gain seems to mask the musicality of the instrument, but this is the case with most Teles – except those with Humbuckers. The body of this instrument is made from a nice, solid piece of pine, which has a retro-looking butterscotch finish, to please all you 50’s fanatics. There’s also a C shaped maple neck, for that extra tonal clarity and 21 medium jumbo frets, which means most builds of guitarist will find this guitar comfortable to play. The neck itself is bolt on, so if you’re a clumsy musician or touring a lot, you’ll be able to have the thing replaced without too much difficulty. As for tone control, this model is pretty simple to get your head around. There’s just one Master Volume dial and two Master Tone controls, so even beginner players will be able to set this guitar up the way they want it. The through body Tele bridge and barrel saddles will also mean you can restring this thing really easily. Overall, Squier’s 50’s Telecaster will be great for anyone looking for a vintage guitar to play blues and 50’s rock n roll with. For this price, you really won’t be able to complain. Price – High-quality pickups and tonewood for your dollar. Neck – The neck here is thin and nicely rounded, with mid-sized frets so that the average guitarist will find it comfortable to play. Vintage specific – This isn’t really such a con, just be aware that this guitar is made to sound very 50’s rock n roll, so just be wary if you want to play other styles. Needs a set-up – This model is imported from China, so shipping can take its toll on the instrument by the time it arrives at your door. This thing will definitely need a proper set up to get the tension and intonation right before you use it. 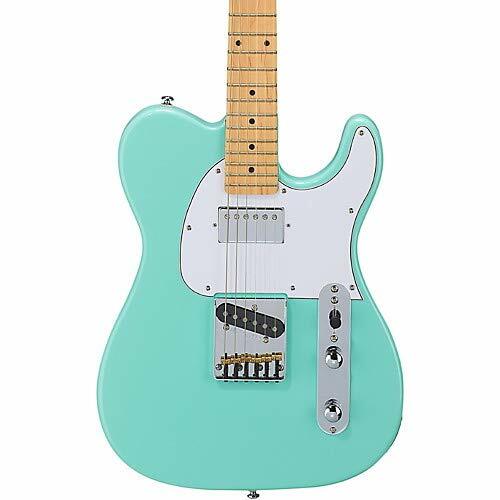 The Modern Player Tele by Fender is currently selling for a slightly higher price than the Squier we mentioned above, but saying that, it’s still very affordable in comparison to the other models we mention today. So, what exactly do you get for the money? Well, I’d say the best thing about the Modern Player has to be its set of pickups. There’s a Humbucker on the bridge, a Strat middle single coil pickup and a Tele single coil neck pup. There’s also a 5-way switching system and a coil splitting toggle to select between them all. So, as you can imagine, this model is way more diverse in regards to tone compared to the Vintage Squier. It’s also different, in that this guitar has 22 jumbo frets, which allow for faster playing techniques. The neck itself is made from high-quality maple, for extra tonal clarity, and has a well-finished, glossy fingerboard for smooth chord changes and licks. So, already the Modern Player seems to be more fitting to meatier styles of music than the Squier, thanks to its beefy pickups and slick neck. It actually sounds a little bit like a Gibson SG when you select the Humbucker! Overall, for this price, there is a lot of high-quality electronics and design going on, so we think that any guitarist looking to play a variety of musical styles will love it. Pickups – There are two types of single coils and a humbucker pickup going on here, so you get a very versatile sound production. Jumbo Frets – These are really wide, so you can play arpeggios and scales faster. Noisy neck pickup – This is noticeably loud on a tube amp and even on some solid states. Doesn’t metal – Whilst it’s true the Modern Player can get meatier than the Squier, it still won’t be quite enough for metal styles. The Bluesboy by G&L is the second most expensive Tele we take a look at today, but it’s certainly worth the money if you’re after an instrument of fantastic quality. We think the best aspect here has to be the warm, rich tone that the Bluesboy kicks out. This is achieved thanks to the guitar having a classic humbucker in the neck position, a G&L Alnico humbucker in the bridge and a high-quality, solid swamp ash body. Saying that, there’s still a single coil G&L bridge pickup thrown into the mix, for a touch of crisp brightness when you need it. The fretboard itself is maple, so it should survive plenty of playing and sustain notes for a good amount of time. The neck is also bolt on, so if damaged you can replace it easily and there are some really well-made brass saddles which allow you to refine the instrument’s intonation to meet your taste. Aesthetically, this thing is definitely the most out there we’ve seen so far, with its baby blue lacquer and gleaming white, 3-ply pickguard, so it’s guaranteed to get you noticed on stage. If you hadn’t clicked already, the Bluesboy is going to be the best for blues artists, looking for warm, rich tones thanks to its meaty, warm humbuckers. Full-bodied tone – The combination of humbuckers here really beefs out the sound this thing kicks out. Aesthetic – This guitar is pretty cool looking and is guaranteed to get you noticed at a show. Price – Check that you can’t get something similar for a little less cash. Why not have a look at Fender’s Modern Player for example. If you’re a fan of grunge music and guitars that look beaten up, then this thing is definitely for you, you could totally see Kurt Cobain smashing up one these during a live set. 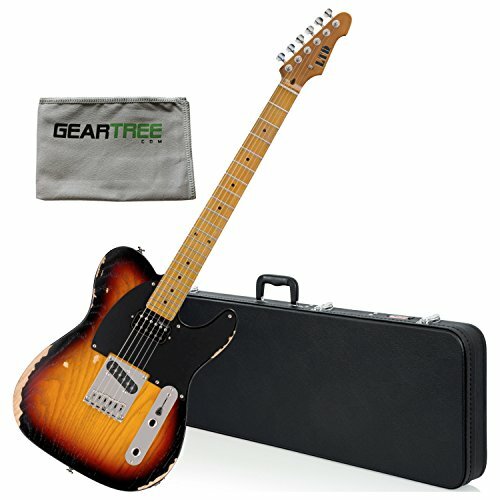 The TE-245 is selling for a similar price for the Squier Tele too, so it’s very affordable considering the technology you get. The best aspect of here has to be the specially designed pickups by ESP. There’s an LH-150 in the neck position and an LTS-120 in the bridge, both of which provide sonic versatility with a higher than average output. Thanks to these pups, the overall tone this instrument brings is aggressive and full when used with distortion, but capable of producing those classic twangy clean notes you’d expect from a high-quality Tele. Another great thing about this model is its well-made ash body and maple neck. The single piece of ash helps to give your sound warmth and richness, whilst the maple neck and fingerboard allow for that extra touch of chime and clarity. With that in mind, the neck itself is a nice, thin U shape build, so even petite guitarists shouldn’t struggle to play chords comfortably. There are 22 extra-jumbo frets, specially designed to allow for fast arpeggios and licks. Overall, the TE-254 will suit guitarists that need a Telecaster that can play well with plenty of drive and distortion. For this price, you won’t be disappointed. Handles gain well – Unlike most of the Teles we’ve talked about, the TE-254 works particularly well with distortion and extra gain. Price – At a similar price to the Squier Tele we mentioned above, you get some amazing technology here. Aesthetic – Whilst the beaten-up look is pretty cool, it might not be to every guitarist’s taste. Neck – Whilst an ultra-thin neck is great for smaller builds, players with a larger handspan may find it a little too compact between strings. Another one from Squire, this one is a vintage modified Tele with some very interesting hardware. For a start, it comes with a Fender-designed wide range humbucking pickup on the neck for a full, warm tone. Its complemented by a Duncan Designed TE-101B single coil bridge pickup, for a sharp and clear tone, to balance things out. To add to that, the 9.5 radius inch maple fingerboard and 21 medium jumbo frets makes it good for those of us with small hands, and gives you that classic bright Telecaster sound and fantastic note sustain. The neck is also C shaped, with ultra-smooth contours and jumbo frets for comfort whilst playing faster riffs. Superb selection of wide range humbucker and single coil bridge pickups. Single coil – can be noisy. The American Elite by Fender is the most expensive Tele we talk about today, and for the price, you pretty much get the best technology out there. The greatest thing about this guitar has to be its pair of noiseless single-coil pickups in the neck and bridge position. These pups are constructed using Alnico V magnets and shielded wire, which guarantees that any unwanted hum is non-existent, whilst retaining that vintage, Tele punch and definition, for ultimate tonal clarity. The second-best aspect here has to be the tonewood used in the body and fingerboard. There’s a single piece alder body for tonal warmth within a convenient lightweight package. The fingerboard is made from ebony, for a seamless, gliding touch and beautiful chiming highs. The neck itself starts off as a modern C shape at the headstock and becomes a wider D shape towards the neck heel. This is quite a rare design, that’s been thought up specifically for fast chord changes and extra comfortable playing. As with most Teles, the neck remains bolt-on, so if you break or damage it whilst on tour, you can rest assured there’ll be no problem getting it fixed. Overall, although the American Elite looks fairly similar to the Player with its black polyurethane finish, however, the quality of pups, fingerboard and neck you get is far superior. Just remember you’ll need some extra savings to be able to afford this beast! Noiseless pickups – These single coil pups are completely hum free, whilst retaining all the twang you need for a classic Tele tone. Ebony fingerboard – This feels like velvet and ensures you’ll be able to play at high speed. Price – This thing is expensive, but you get the highest quality technology out there for your dollar. Plain – Just like the Fender Player, this guitar doesn’t really stand out, it’s more about having a professional, classy look that will blend in with others in your band. So, we hope you’ve enjoyed reading through our personal Telecaster favourites. 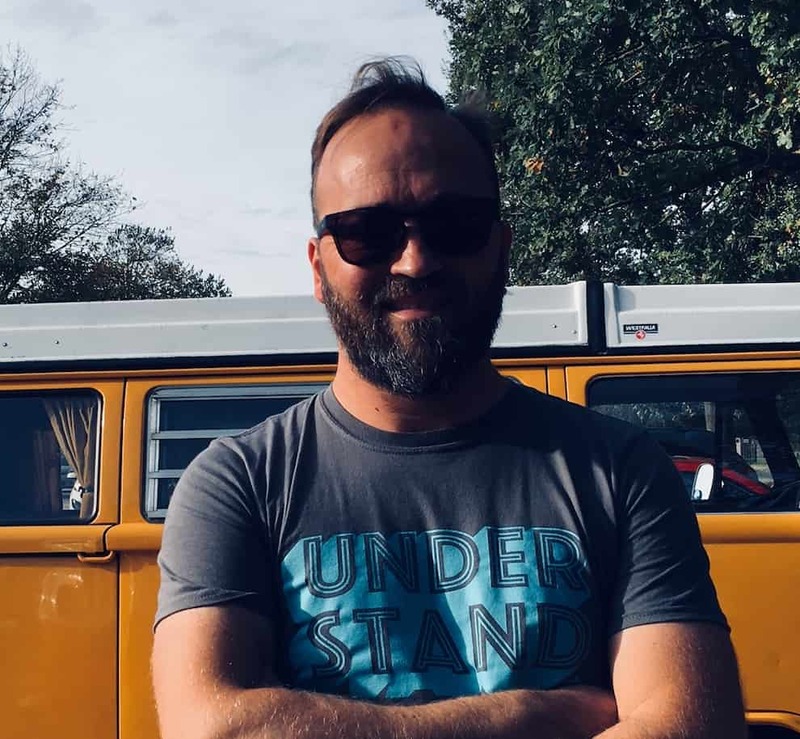 Just remember, there’s no correct choice when it comes to buying a model, it depends on what you need as a musician and how much money you’re willing to fork out. With that in mind, if you’re looking for that classic Telecaster tone, then the Fender Vintage Modified Telecaster is selling for a mid-range price and has a classic single-coil pup for that bright twangy tone. If you’re on a budget, then the Squier Classic 50’s Tele is a fantastic, affordable option if you’re a fan of 50’s rock n blues. If you need a guitar with versatility, then the Fender Modern Player is your best bet. This model features three different types of pickup – One Humbucker, one Strat single coil and one Tele Single coil, for varied tone production. On the other hand, if you want to play heavier genres of rock, like grunge, then the ESP LTD Telecaster will suit your band. This guitar comes with custom made LTD Humbucker pickups, for a really beefy edge that works well with distortion. If you’re into blues and want something that looks stylish, then the Bluesboy will give you a great rich tone and a funky aesthetic, which is sure to turn some heads! Finally, if you’ve been saving up and want to invest in the best that money can buy, then the American Elite by Fender is your best option. This guitar has noiseless pickups and a velvet ebony fretboard, for ultimate playability and tone.